In the bowl of an electric stand mixer fitted with the whisk attachment, whisk together the cream and sugar on the highest speed until soft peaks have been achieved. Then set aside in the refrigerator until ready for pancake assembly. Bring the black cherry juice to a gentle boil in a heavy bottomed sauce pot over medium high heat. Then whisk in the cornstarch and water very gradually until well combined. Allow the mixture to come back to a boil and then lower the heat to maintain a gentle simmer. Add the fresh cherries and stir constantly until the desired consistency is achieved. Keep in mind that the sauce will continue to thicken as it cools. If the sauce is too thick, stir in some water. When done, cover the pot with its lid and remove from heat until ready to serve. Serve warm over pancakes. Preheat the oven to 200 degrees F and place a baking sheet on the middle rack of the oven. Melt the chocolate in a double boiler, stirring constantly until smooth. Meanwhile, in a large bowl, whisk together the flour, baking powder, and salt, and set aside. Then remove the bowl of chocolate from the heat and stir the butter into the melted chocolate until combined. Stir the cocoa powder into the warm melted until well combined. In a small bowl, whisk together the eggs and sugar until smooth. Then, while stirring the melted chocolate continuously, add the egg and sugar mixture in a thin, steady stream. Then stir in the milk. Once combined, gently mix in the dry ingredients until just moistened and combined. It is important not to overmix the batter. Heat a large nonstick skillet over medium or medium high heat. Or use a griddle set to 350 degrees F. Lightly grease the hot pan or griddle using butter and/or vegetable oil. Then ladle approximately 1/4 cup of the pancake batter onto the hot cooking surface. Cook until bubbles have surfaced and the edges look cooked, up to 3 minutes. Then flip the pancake over and cook until done, up to another 3 minutes. Both sides of the pancake should be nicely browned and the middle of the pancake should be soft, moist, and just cooked through. Do not overcook the pancakes. Place the cooked pancakes on the baking sheet in the oven to keep warm until ready to assemble. I made 2 layer pancakes, but you could stack as many pancakes as you want. You could make a black forest pancake cake if you use more layers. Place one pancake on a serving plate. Add some black cherry sauce onto the pancake and top with some whipped cream. Place another pancake on top. Repeat as many times as desired, but be sure to work quickly, because the whipped cream will melt and run. For the last (i.e. 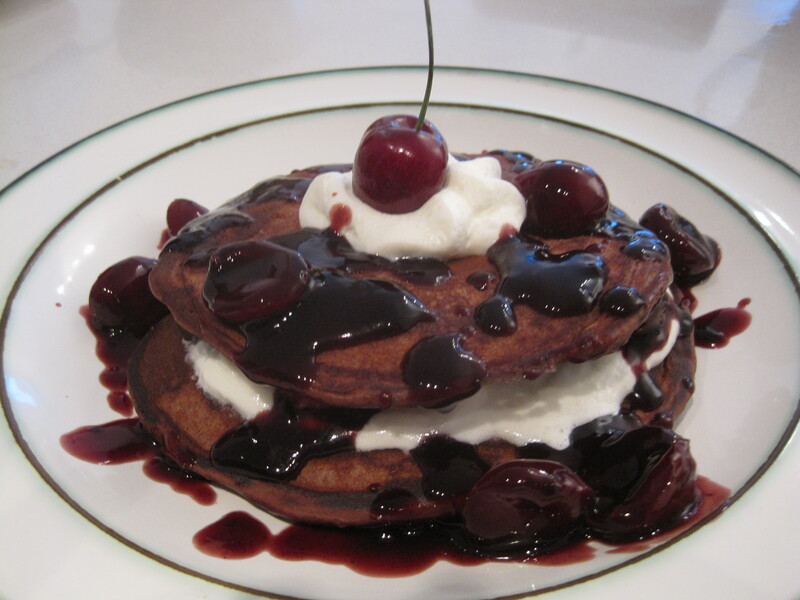 top) pancake layer, simply add a dollop of whipped cream, place a fresh cherry into the dollop of whipped cream, and drizzle some of the black cherry sauce all over the top and sides of the plate. Garnish with chocolate curls, if desired. Serve immediately.